Let's face it. We've all met them at least once in our working life. The gossip-y co-worker, the rage machine, the passive-aggressive person who keeps increasing the thermostat when you've lowered it, the fashionista, the loudspeaker who distracts everyone with her endless Skype calls... The list goes on. She's the one who struts into the office and sometimes even changes outfit for evening plans. She's the one who saunters in after a holiday in the Bahamas or Maldives and flaunts her glorious tan in a sleeveless silk blouse - she might even still have her sunglasses on! She's the one who wants you to be envious of her and her model figure and her model life. How to deal: Know that the rosy image of her life is what she wants you to see. You've got your own life and it's damn awesome, so you don't have to compare your life to hers or aspire to be her. Often the one who would mention how crazy his workload is so as to prevent everyone else from asking him for help, or leaving anonymous notes in the pantry about stealing his food or using his coffee mug or asking others to clean up after themselves. How to deal: This could go both ways. You either don't engage and hope that his efforts will die down and he'll give up with his Post-It notes or drive him nuts by doing what he hates. Just be sure you have the stamina to go to war with him. The Gossip lives for the latest office scandal. Always with her ears pricked for news or a hushed conversation, she is always found discussing someone's divorce, hookups, eating habits, imminent resignation or promotion. How to deal: Keep a wide berth far from her roving eyes and pricked ears. And whatever you do, don't share your personal problems with her. She's not the best secret-keeper around, and that's an understatement. Be it stealing credit for your work or throwing you under the bus at a meeting you are supposed to be a team, or even badmouthing you to the management behind your back, the backstabber pretends to be all chummy with you and then turns against you with underhanded moves. They pay attention to what you are doing, and uses that to one-up you later. How to deal: Keep your distance. You don't need fake people in your life, and even if you have to work with that person always keep an emotional distance from her and be wary of giving her the upper hand by over-sharing too much personal information that she can use against you. This is not a gender-specific personality. The Rooster is simply the one who feels the need to greet everyone when she comes in and when she leaves. When you respond in kind she launches into a detailed narration of her weekend. When you don't, she goes, "Well, someone's in a bad mood." How to deal: Raise your coffee mug at her if you don't feel like chatting. And if she tosses a sarcastic comment your way, tell her your mood is positively correlated to the amount of coffee you drink. 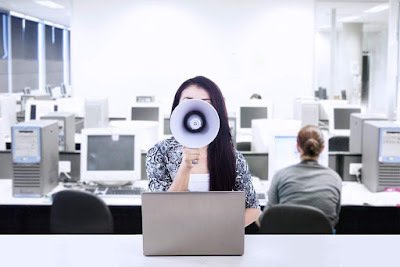 Whether your office has an open concept or is divided into cubicles, you will be able to hear her from the other end of the workspace thanks to her impossibly sonorous voice. It's even more torturous if she puts on a fake accent that induces incessant eye-rolling on your part. How to deal: Earphones. Music. Pronto. Or, if you would rather take matters into your own hands, tell her tactfully that you can hear her describing what she had for lunch and it's just a tad distracting. Have you met any of these office personalities? What others have you encountered and how do you deal with them? Sound off in the Comments section below!